People love posing in pictures with animals. Some prefer the cute, cuddly, domesticated kind; others the larger and deadlier ones. In recent times, however, a critical mass of animal welfare organizations and activists has been calling attention to the impact of such photography on the animal participants. Very often, there is significantly more animal discomfort — including cruelty and suffering that damages conservation efforts — than meets the casual observer's viewfinder. While wildlife viewing practices have certainly improved over the last few years, local and international organizations like World Animal Protection have pushed for even greater awareness of and better behaviors around animals. To that end, in October 2017 the organization launched a Wildlife Selfie Code that helps everyone learn how to take photos with wild animals without exploiting them for entertainment. And in December 2017, following a World Animal Protection investigation, Instagram took action to inform its users about the exploitation of wild animals involved in interactions with humans. 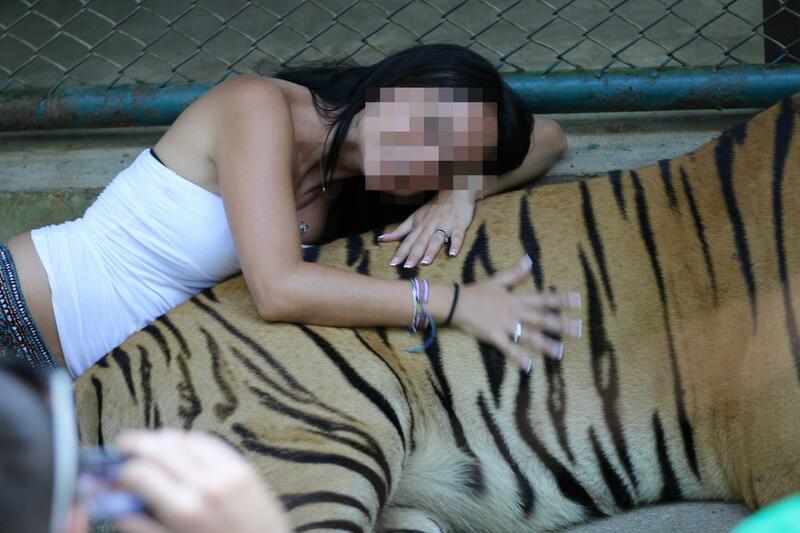 The wrong way to be pictured with a tiger! The selfie code has some essential dos and don'ts. 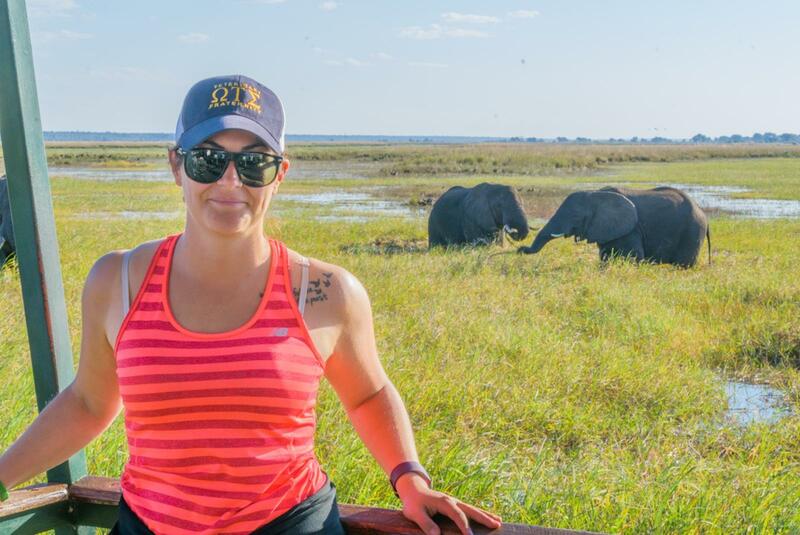 Carla Pisarro, World Animal Protection's communication manager in the US, told Green Matters that the Wildlife Selfie Code makes clear that a traveler doesn't need to avoid wildlife experiences during a trip. In fact, these experiences are a critical way to raise money for conservation and education, although effort should be made to research and identify companies and sanctuaries that enforce best practices. The key, she said, is in how photos are taken, and making sure people understand how easy it can be to avoid cruelty when snapping pictures with animals. 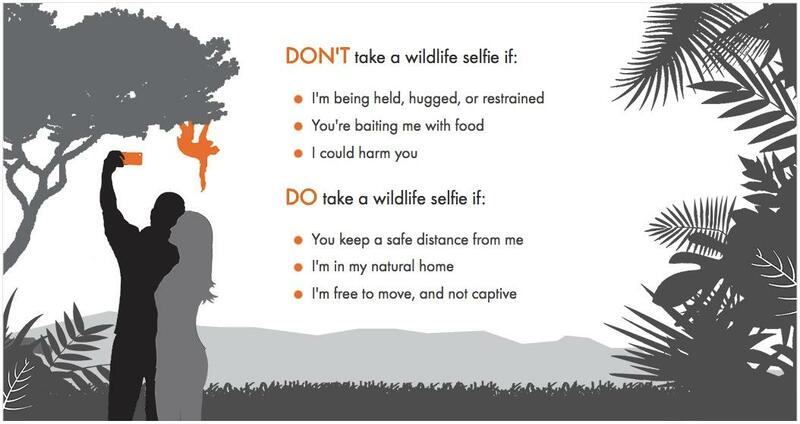 "The Wildlife Selfie Code is a tool for people, asking that they watch out for the don'ts and dos," she said. "We just wanted to show what a good selfie looks like." 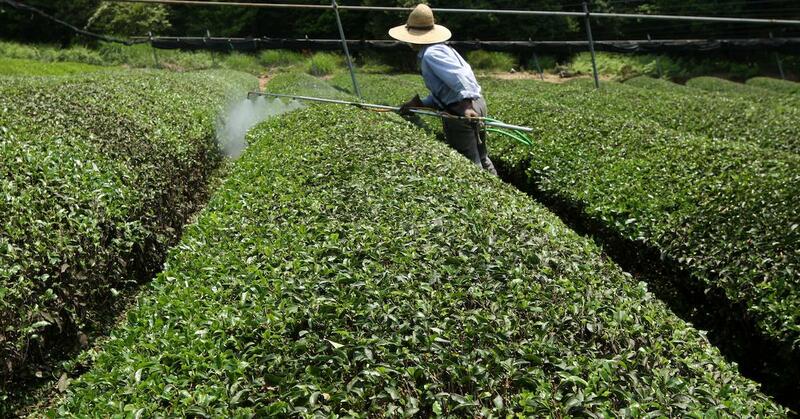 Bad practices have left half a million animals exploited. As international tourism explodes, more mainstream options become available for face-to-face interactions with endangered creatures, and the prevalence of social media sharing websites like Instagram carry everyone's images to the masses, more people are taking selfies with wildlife or being photographed up close with it. More demand for wildlife interaction means more tourist attractions that offer posed pictures with sloths, koalas, monkeys, or tigers; elephant rides or performances; walks with lions; and swims with dolphins. There are currently around 550,000 wild animals in captivity and being abused for tourist entertainment, according to World Animal Protection. Animals are forcibly taken from their native and natural homes, held captive in unsatisfactory conditions, put through exacting training programs to make them calm and comfortable around humans, and sometimes drugged to ensure docility. 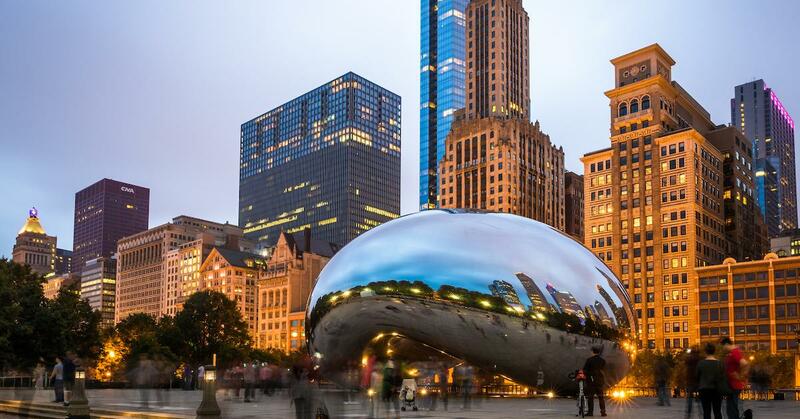 "Most tourists are not aware of this," Pisarro said. This negative feedback loop only ends when tourists demand authentic outdoor experiences where all wildlife stays wild — and where tourism companies and destinations insist on ethical practices. So in October 2017, after a cutting-edge image recognition research study of Instagram's 34 billion pictures, World Animal Protection alerted the company to a 292-percent increase in the number of selfies with wild animals posted on the site since 2014. Almost half of those selfies showed particularly bad interactions with wild animals – hugging, holding, or other inappropriate handling. And that's what inspired the Wildlife Selfie Code. Setting aside old habits is hard, but possible. 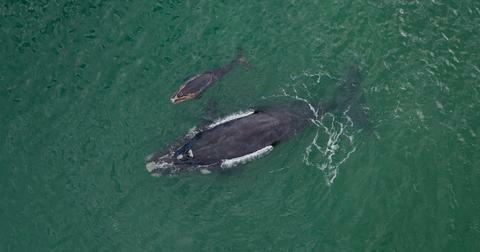 At the time of publication, nearly 235,000 people from around the world have committed to the Wildlife Selfie Code. 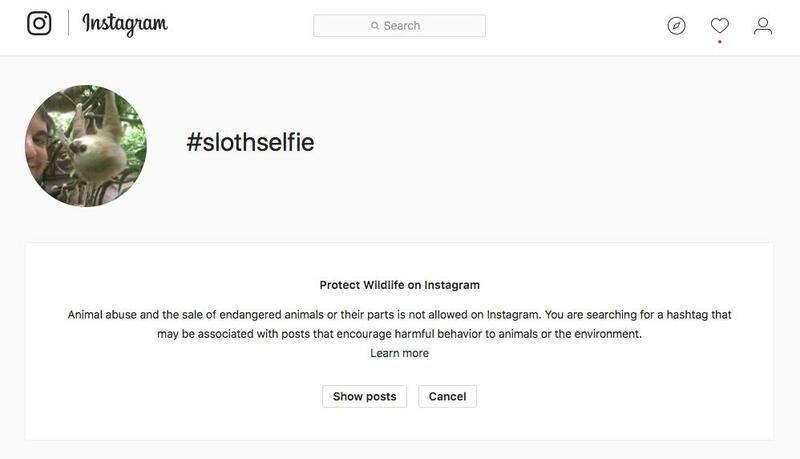 Even better, in December 2017 Instagram put in place a content advisory screen that automatically appears when any one of its more than 800 million monthly active users search for the hundreds of hashtags associated with harmful behavior to animals, such as #slothselfie or #monkeyselfie. "Animal abuse and the sale of endangered animals or their parts are not allowed on Instagram," it warns. "You are searching for a hashtag that may be associated with posts that encourage harmful behavior to animals or the environment." Users are then invited to click through to a dedicated wildlife exploitation page on Instagram where they're warned to "consider whether an animal has been smuggled, poached or abused for the sake of tourism." Users are furthermore told to "be wary when paying for photo opportunities with exotic animals, as these photos and videos may put endangered animals at risk." For additional information about endangered wildlife and exploitation, there are links to special pages on World Animal Protection and World Wildlife Fund, and to the website of TRAFFIC, which ensures that trade in wild plants and animals is not a threat to the conservation of nature.